Old Mr. Olympia Ronnie Coleman the Routine Man who entered a record 15 Mr. Olympia and won a record tying eight contests celebrates this year his third anniversary of his last Mr. Olympia appearance and the fifth anniversary of his last Mr. Olympia win. Ronnie Coleman has a lot of bodybuilding fans and those were many even for the simple fact that Ronnie has huge bulking biceps. Now i will show you what makes Ronnie Coleman`s biceps training unique and i will show you even a typical biceps workout routine that Ronnie used to do when preparing for contests such as Mr. Olympia. 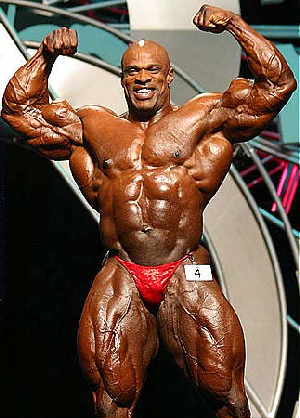 Mr. Olympia Ronnie Coleman you and your biceps have my respect! Permettez moi de ne pas être d’accord avce vous sur ce sujet.